I think I'll get this for my Dad for Christmas! He would totally dig it. Edit: I think THIS painting conveys the same message without the added bonus of being super-creepy. What do you guys think? The second one is pretty straight forward... I'm not sure what's supposed to be going on in the first one. I like the first, cuz, finally, a manly Jesus. Satan looks pretty cool too. I'm confused, is this like a "Where's Waldo?" thing & if so, where's Satan? Yeah -- in a DRESS! I'm almost positive I missed this scene in the New Testament. Satan is along the right edge, about in the middle. He has a blanket on his head. 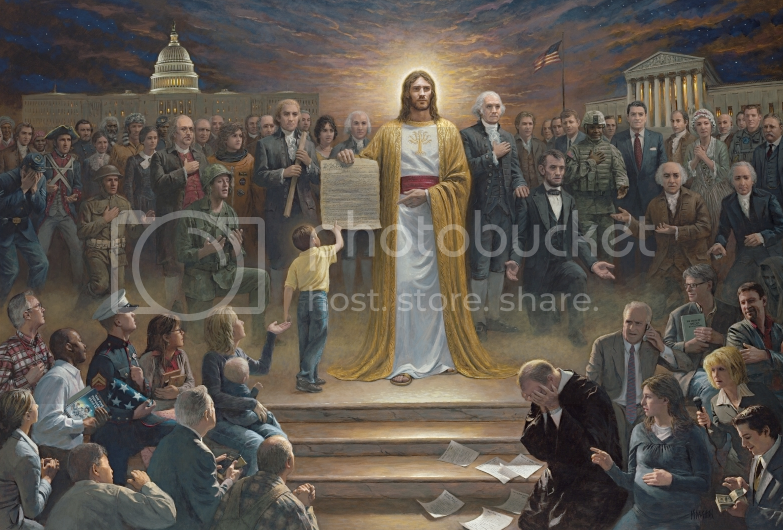 Follow this link and read some of the descriptions of the individuals in the painting. Some of them are quite hilarious. No, man. This scene is from The Five Thousand Year Leap from famed nutcase Cleon Skousen. I'm a self-admitted right-wing wacko, but I got NOTHIN' on THAT guy's level of insanity. Get a clue, man, that's not a dress! That's, um, casual lounge wear. In Europe, everyone wears that. At home, after work, after death in heaven . . .
And what is the deal with Jesus wearing "The White Tree of Gondor" armor? See the similarities? I wanna see a picture of Jesus wearing a tube-top, capri pants, and crocs. That would be just as manly as the dress.